The Wharfside is well-stocked shop inside Topsy Turvey right on the shores of Lake Erie. For all the boaters and fishermen out there, the Wharfside is a welcomed sight. Centrally located in downtown Put-in-Bay, the shelves are full of snacks, drinks, beer, cigarettes, and other items to take on boat. Most importantly they carry a great selection of tackle, bait, sun care, and other important boating accessories. You can also purchase a State of Ohio Fishing License here. Lake Erie is known at the Walleye Capital of the World. Walleye is a fine-flaked fish with few bones. Prized for their succulent, sweet, yet mild flavor, Walleye is a thick fillet, perfect for grilling or breading. Anglers often catch 17 - 18 inch fish but lucky ones can hook 22- 26 inch ones. Other favorites include Yellow Perch and Smallmouth Bass. Restaurants throughout the island serve up plenty of Walleye and Perch dishes, but there is nothing like catching and eating your own. This bar has some of the best lake views on the whole island. Located about as close to the water as you can get, Topsy Turvey is a cozy bar with a friendly vibe. Their menu is concise and tasty. Try one of their signature Cubans for either lunch or dinner. The Reuben’s and Shroom Po’Boy is quite tasty. They also serve freshly caught perch, fried and served in a basket or crispy role. Signature drinks include Brandy Alexanders and Bloody Mary’s. Come by and enjoy a stiff drink after a day on the boat. For those heading to the island via boat, there are plenty of docks, both private and public to dock for the day and night. The downtown docks are always pretty busy and include the Village Docks and the DeRivera Docks. These docks always have a lively party vibe. 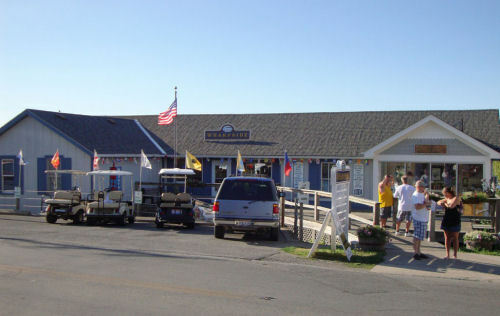 Private clubs include the Put-in-Bay Yacht Club and the Park Place Boat Club.